John Lawter is a registered Landscape Architect and city planner with 30 years of experience in higher education administration. John currently serves as the Associate Director of Plant Building and Grounds Services at the University of Michigan responsible for grounds, custodial, pest, equipment garage, waste and recycling, and the Campus Landscape Architect’s office employing 600 FTE with an annual operating budget in excess of $30M. Rob Doletzky, Grounds Manager at the University of Michigan has over twenty five years of experience in the Green Industry. He is responsible for grounds maintenance and landscape installation. He attended Eastern Michigan University and is a member of the Michigan Green Industry Association and Professional Grounds Management Society. Kenn Rapp is a licenced landscape architect who has worked for the University of Michigan since 1987 and currently holds the title of University Landscape Architect. He has a Bachelors of Landscape Architecture from Michigan State University and a Masters of Landscape Architecture from the University of Michigan. In addition to providing landscape design for the campus Kenn also works with Grounds Services to plan and prioritize campus landscape maintenance. Kenn is a member of ASLA and served as President of the Michigan Chapter of ASLA in 2008. It is now commonly known that the appearance of a college campus affects recruitment and the mental and physiological health of the students, faculty, and staff who live and work there. First impressions of the grounds can affect enrollment of students, employment of faculty and staff, and the attitudes of visitors and benefactors. Creating a "quality environment for learning" is the mission of all grounds managers as they attempt to balance campus aesthetics with real-world economics. The same can be true for any facility that has a substantial investment in their grounds. The facility grounds are usually what is first encountered and therefore influences first impressions. Grounds maintenance operations have the unique challenge of contending with unpredictable variables such as living plants, pests, and weather. Grounds administrators must identify best practices to accomplish their mission. Grounds maintenance organizations operate with varying degrees of success. Success is most often achieved through leadership by staff well trained in forestry, turf, and horticultural practices, task management, equipment maintenance and management, human resources, work loading, and scheduling. In addition, modern grounds managers must be aware of their operation's effect on the environment, from such things as fertilizers, herbicides, pesticides, and sand and salt during winter de-icing operations. The wealth of information that has been collected in this area provides a new sophistication, allowing grounds managers to better accomplish their mission. Administrators as well as employees must now be aware of the latest technological advances as well as government regulations, which often require specialized training and even specialized individuals to accomplish the many tasks confronted. Successful grounds maintenance organizations are characterized by strong leadership, including well-trained and enthusiastic supervisors with adequate staffing and equipment. Grounds managers may face different responsibilities based on institutional needs and the manager's abilities. Grounds sections are often charged with additional responsibilities not directly related to traditional services in order to use labor and equipment more economically. Those responsibilities may include such functions as waste removal, recycling, moving, pest management, and special events support. Grounds maintenance groups generally include a variety of disciplines. A site development group may include a landscape architect, a horticulturist, a surveyor, civil engineers, or other grounds construction specialists. In some cases, this group may be aligned under an office of design or a unit called "University Architecture" or "Engineering." Plant bed and turf maintenance groups are responsible for general upkeep for the grounds. Teams are often used in this application to create a uniform and consistently maintained campus with responsibilities for the general tasks that, when done all together, create a finished appearance. Plant bed maintenance may include weeding, watering, planting, light pruning, and general leaf and litter policing. Turf maintenance may include mowing, edging, and trimming. A landscape specialty group is often formed to support the general landscape maintenance group. This group may include people with special skills to handle the diverse problems the campus faces and may include chemical application specialists, arborists, turf renovation and irrigation specialists, horticulturists, greenhouse operations personnel, and athletic field maintenance personnel. Additional specialized crews may be necessary for maintaining site furniture, grafitti removal, emptying exterior trash cans, and litter removal which is often the most time consuming task on a college campus. Grounds maintenance groups are typically organized into zones or areas. Each zone or area has a quantifiable realm of responsibility, allowing the team to feel personally responsible for their area or zone and enabling the manager to monitor performance. Some special tasks that do not fall within this concept, such as chemical application, heavy pruning, or planting, may be handled by roving specialty crews, working in support of the area or zone crews. It is essential that the specialty crews have the same goals of consistently outstanding appearance as the grounds maintenance crews. Finally, many organizations are supported by an equipment maintenance shop, which may or may not be attached to the grounds department. 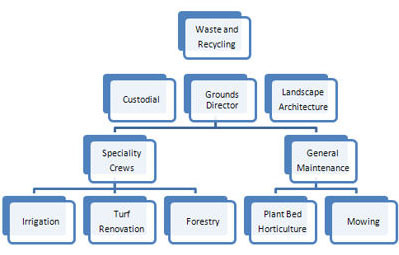 A sample grounds maintenance organizational chart has been included (Figure 1). Although it is often difficult to establish clear guidelines for all functions, it is important that grounds employees clearly understand their functions and management expectations concerning their performance. Many grounds functions will require close and effective coordination with other functional areas within the facilities organization to ensure effective results. One such function is snow removal. The grounds crew typically has a clear responsibility for snow removal on sidewalks, exterior stairs, and parking lots, whereas the custodial staff may be responsible for entryways, building steps, wheelchair ramps, or walks leading to the building. A clear, mutual understanding of these responsibilities and close coordination to ensure that the snow removal tasks are fully completed are essential to success. It is possible to contract many grounds services or even the entire function. Services that are most commonly contracted include pest control, waste removal, tree care, and mowing. Some organizations use contractors to supplement seasonal tasks when it is not practical to have staff year-round, such as for snow removal. Careful analysis of the advantages and disadvantages, however, should be a prerequisite to contracting for any services. The chapter on contract management and APPA: The Association of Higher Education Facilities Officers' Contract Management or Self-Operation discusses important issues that should be considered and provides good general guidance. Once a decision to contract for services has been made, careful development of the specifications is essential to a successful contract. Effective management of the contract services is another key to success. Close supervision, inspections, and feedback to the contractor are all essential. Ensuring that the special needs of an educational setting and the flexibility of campus events can be accommodated can be difficult with contracted services. Many colleges and universities are finding that the use of part-time labor is an alternative to contract services and provides needed cost reductions while still preserving the greater degree of control that may be lost with contract services. Grounds managers face the dilemma of environmental concerns as they pertain to their area. Chemical application specialists need licensing and special training and also need to be kept abreast of new developments. Environmental concerns have led to the creation of invasive species removal programs and limit the types of fertilizers, herbicides, and pesticides that grounds departments may use. 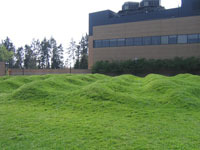 Some campuses have created no-mow programs where turf is cut twice a year (fall and spring), reducing the amount of turf maintenance, which reduces chemical use and pollution from mowers. The use of bio-fuels, electric vehicles, and 4-stoke engines are additional environmentally friendly practices that should be considered in landscape planning, as well as the requirements of the Americans with Disabilities Act. Finally, new plantings have to be carefully placed so that they do not encourage criminal activity, block lighting, or otherwise create an unsafe environment. Planning for the performance of grounds maintenance functions should be based on both a land-use inventory of the scope and nature of the grounds to be cared for and a determination of the standards of care. The land-use inventory should contain quantitative information about the campus landscape, such as the square footage of lawn, planting beds, and perennial beds. What land uses are inventoried can be determined by the tasks needed to maintain them. Items with similar maintenance needs can be grouped, whereas items with specialized maintenance needs should be inventoried separately. Standards of care are typically set by the desired level of maintenance established by the administration. The data resulting from the land-use inventory and standards of care can be very helpful in showing the administration what levels of maintenance are possible based on resources available. Standards of care should be set for the various zones or areas of the campus and personnel and resources appropriately assigned. The size of the zone is not arbitrary and should be determined by the previously identified maintenance needs. Small zones with high-maintenance land uses or high standards of care may be taken care of by the same size crew used for larger zones of low-maintenance land uses. Standards may be established on a campus-wide basis or individually according to buildings and functions. The former gives a more uniform appearance to a campus and is much less complicated to carry out. One should consider the visual view shed when determining the maintenance standards of an area. Obvious changes in the level of maintenance from one area to another are undesirable. The transitions between higher and lower standards of care should be well planned and logical. When standards have been set, priorities should be established according to functional processes, institutional needs, and environmental dictates. Priorities define the areas of the institution that will receive the highest care. Often, higher levels of care are made possible by reducing the level of care in other areas rather than by obtaining additional funding. It is important for all maintenance staff to understand where the high-priority areas are so that the maximum possible care is given to these areas and not wasted in areas of less importance. For maintenance staff who have traditionally tried to maintain everything at a certain level, the new direction of spending more time in some areas and less in others can be difficult. A detailed explanation of the reasoning behind establishing priorities can help with this transition. After priorities are set, scheduling can begin. Scheduling is a dynamic process, requiring constant updates as the institution changes. Industry time standards such as those developed by the Professional Grounds Management Society are very useful for benchmarking. Scheduling usually includes time-motion studies to establish time standards for tasks unique to each institution. Time-reporting systems are often used to establish time standards. As each individual task is scheduled according to the standard, crews will be proactive in their work loading, and emergency "fire fighting" will be minimized. Preventive maintenance scheduling that may be less routine is effectively done by a computerized preventive maintenance program. In the area of equipment maintenance, preventive maintenance printouts are essential. Computerized inventories of as-built locations of plant materials allow special conditions of maintenance to be integrated into the preventive maintenance program. Repetitive scheduling is most efficiently handled by developing schedules on calendars and sharing them with all affected parties within the facilities organization, including maintenance staff, maintenance supervision, and customers. A well-planned, continuing program of training will benefit any area of the facilities organization. This is particularly true for grounds maintenance activities. In addition to general training applicable to all facilities staff, training should be provided for grounds staff in such specialized areas as the care and operation of grounds equipment; the most effective techniques for the planting, maintenance, and pruning of plant materials; the requirements of government regulations; and safety. Chemical application specialists, for example, need special training and licensing and must be kept abreast of new developments in the field. Proper training in the calibration of all types of equipment used for the application of all types of materials is important. A range of resources is available to support effective training programs. State extension services can be one of the best sources of training assistance and materials that are both of high quality and specific to local area needs and conditions. State or local nurserymen's associations can be another good source. Community colleges and local technical schools typically offer programs in various elements of grounds care. Videos and other training materials are often available from the suppliers of specialized grounds care equipment. Training programs will be most effective when they are scheduled regularly and incorporate realistic situations that may be encountered in the work environment. Good documentation of training is essential. The increasing costs of labor make proper equipment selection and use all the more important. The labor required for maintenance procedures can be dramatically reduced when effective and efficient machinery is selected. Proper investigation through the purchasing process, demonstrations, and collaboration with similar institutions with similar problems can be a valuable part of this process. A proper preventive maintenance program is critical. Downtime can waste considerable amounts of money. Not only will downtime halt the operator, but it can halt several other crews and disrupt scheduling as well. Factory training for the equipment maintenance mechanics as well as the operators should be strongly considered when constructing the purchasing agreement. Worn and undependable equipment can disrupt operations and increase costs. A timely replacement program can pay dividends. Replacement scheduling can allow for budgeting in a systematic fashion, minimizing the peaks and valleys in equipment funding needs that occur in the absence of a strong replacement plan. Grounds operations typically require expensive machinery, but the machinery can be cost-effective in diverting labor and conserving resources. Whenever possible, equipment should be selected for multiple purposes. Many new products have attachments, eliminating the need for several specialized pieces. Leasing equipment can be an attractive alternative to ownership because one can avoid the large capital investment costs. Short-term leases or rentals will often be the most cost-effective way of obtaining equipment resources that are needed on a periodic or temporary basis. No lawn is stable. It is either improving or declining in quality. Even when a lawn appears to be in good condition, hidden problems may be beginning. With proper moisture and fertilization a lawn will be established, weeds will be crowded out, and grasses will grow abundantly. However, proper moisture and fertilization do not preclude invasion by fungi and insects. Grass will not continue to grow in dense shade. Beware of miracle advertisements. There are varieties of grasses that tolerate varying degrees of shade, but none can tolerate the shade caused by dense trees. The problems of dense shade include dry soil caused by the trees absorbing much of the water. Be wary also of growth regulators; they are not for every lawn. A number of restricted-use growth regulators are available on the market, and each is effective for different turf situations. Cost factors must be considered to determine the economic feasibility of growth regulator use. Also, growth regulators of turf may cause physiological problems in certain areas. Non-irrigated lawns usually experience a dormant period from mid to late summer if rainfall is below levels necessary to sustain growth.This is normal, and the brown-blue grass will turn green with sufficient water. Consult a turf specialist or agronomist for seed selection in any given location. As a result of research on turf grass varieties, new selections regularly come on the market. Selection of a combination of grasses suitable for a specific use must be made individually. Many factors determine seed selection, including use of the lawn; mowing heights; available water and fertility rates; insect and fungus resistance; shade percentage; and intensity, soil factors, and drainage. No common seed mixture is perfect, and no two turf consultants will prescribe the same solution. Proper preparation for a new lawn ensures the desired result. In new construction, the site is usually in poor condition for the establishment of turf. Depending on the priority level of the lawn, all kinds of problems may have to be corrected. For example, sheets of plywood may be hidden just below the surface, large concrete chunks may be embedded in the soil, and buried plaster or lime may cause alkalinity problems. Grounds managers must inspect the construction site before planting a new lawn and correct any abnormalities, or unforeseen problems will occur for years afterward. During the grading process, the most important consideration is drainage. 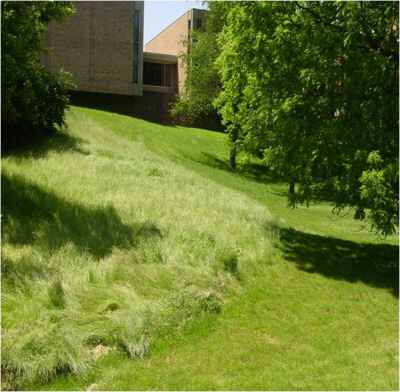 No turf area should slope less than 1 percent. Pockets of undrained turf will result in a multitude of problems. Areas compacted by heavy equipment should be loosened, or turf establishment will be difficult until the soil loosens naturally, which can take several years. The entire site should be tilled and evenly shaped. A fertilizer chosen for the specific soil condition should be applied and worked into the surface. Soil analysis is almost always necessary to determine fertilizer requirements. Several methods of seeding can be used, depending on the site. In small areas, seed might be distributed by hand-carried rotary seeders. For larger spaces, a slicing seeder or drill might be used, and large areas of steep slopes may require hydro seeding. The latter method can incorporate fertilizer, seed, and mulch in one operation. Erosion control blankets are necessary when seeding on slopes or in areas where sediment can reach storm drains or other avenues to public waterways. These blankets also retain moisture, shade the seed bed, and protect from other potential damage. Irrigation systems, once deemed frivolous and undependable, have become a mainstay for turf and plant maintenance in the current grounds care industry. Such systems not only provide a cheap insurance policy for new plant and turf installation but also serve as a potential source of labor and dollar savings over time. Hand watering with hoses and sprinklers is an inefficient use of water as well as labor. An irrigation watering source that controls water usage through specific precipitation rates and precise watering times is more effective. Properly designed and installed irrigation systems require little maintenance. Seasonal watering times may be needed to react to severe deviations from regional weather norms, and winterization and restart will be required in cold climate areas. Proper operation and an appropriate schedule of watering times combined with a good spraying and aeration program will control problems from fungus and thatch. Irrigation systems will benefit any landscape setting and will represent an asset to the facilities organization. Once a system is installed, it requires only occasional maintenance and, in colder climates, winterization. Watering amounts are critical. How much water depends on soil type and turf variety and the seasonal changes of the evapo-transpiration rate (defined as moisture taken from the soil by plants and air). Potential problems with irrigation include increased fungus growth, thatch accumulation, and soil compaction. A good spraying and aeration program will keep these problems in check. Fungus diseases can also be reduced by timing watering to minimize the time that the turf is wet during a 24-hour period. A profusion of disease and insect problems may exist in lawns. As the use of lawns increases, there may be an increase in problems. Selecting grass for disease resistance is important, and a program of seasonal treatment should be established to cope with standard problems. One common problem with lawns is the accumulation of thatch. Thatch causes a roof effect and reduces the chances of air and water reaching the roots of the grass plants. It also creates an environment conducive to insect and fungus disease growth. Mowing frequencies and other cultural practices can reduce the buildup of thatch; however, if this layer of thatch gets too thick, it must be removed or a poor turf will result. Chemical de-thatchers have been introduced, but none have proven successful. Mechanical cultivation is the only answer. Core aeration will modify thatch. Annual aeration of heavy-use areas will reduce compaction and allow moisture to permeate the surface. If human resources and budgets are still of primary concern after this management practice is applied, other measures may be taken. You may need to prioritize your lawn areas or even go to non-maintained grassy areas in lower priority sections of your campus or facility. If properly graded and drained, most lawns can become acceptable if management establishes a systematic program of chemical treatment, fertilization, and irrigation. Each area of the country requires specific programs. If they are followed, the lawn quality will improve. The quality turf that is required on some athletic fields will require more maintenance. Irrigation, good drainage, fertilization, aeration, over-seeding, top dressing, and chemical application are all necessary to maintain or increase the turf's durability. Many volumes of literature and university courses detail athletic field installation and maintenance. Of course, no maintenance program can ensure safe, playable turf on overused fields. If such a demand exists for athletic turf, additional areas should be created so that playing fields are not used to the point where the turf is always in a state of decline. The maintenance problems of plant materials—trees, shrubs, ground covers, and vines—are directly related to the initial selection of the specific plant. If improperly chosen, a plant will be a problem in various ways throughout its life. Many factors must be considered to ensure that the proper plant is chosen for a specific location. The one problem commonly overlooked is space. Many times the plant selected will grow considerably larger than the space allows, which results in continual pruning and, finally, replacement. A common error of designers is to use several plants, causing overcrowding, where one will do the job. Poor selection may require continuous treatment to condition the soil acidity, or a plant may be chosen that will not withstand wet conditions or areas of poor drainage. Selecting plants that are not hardy enough for a geographical zone or exposure to sun, snow, or strong winds can be disastrous. Soil conditions determine many future maintenance problems. Selection of plants to withstand the various conditions is critical. In urban settings, some plants are harmed by air pollutants; this fairly new problem must be considered. The person selecting plants for use on campus should be aware of these common problems. Occasionally, a landscape architect or other designer who practices in a different environment and does not have firsthand knowledge of special conditions affecting plants on a specific project is selected to create a planting for a given site. The designer will probably use plant lists for the zone intended, but local conditions may be entirely different. Therefore, consultants must be completely familiar with the area and its problems. Involving the maintenance staff familiar with the soil conditions, circulation patterns, and previously successful plant material is also worth considering when choosing plant material. One way to overcome this problem is to have the landscape architect describe the design intent of the plants they are proposing rather than specifying specific types of plants. Is the landscape architect looking for a tree or a shrub? Is it large or small? Is it deciduous or evergreen? What is the plant intended to do? Once the design intent is determined, the local horticultural and maintenance staff can provide a list of plants that would meet those characteristic and also thrive in the existing site conditions. This method allows for the design intent of the landscape architect to be met while making sure that the specified plants will thrive. Healthy plants will ultimately reduce maintenance while increasing the aesthetic appeal of the landscape. There are several steps in the planting procedure that frequently cause problems. Preparation of the hole is important. Trees planted in heavy soils with poor drainage die from too much water rather than from a lack of it. When the hole is dug, it should be no deeper than the depth of the ball to plant at the original level. This keeps the plant from settling out of plumb or to a level that will not drain. The hole should be significantly wider than the ball. There are strong arguments for not amending the soil to a degree that will cause water filtration problems between different soil interfaces; however, a 5 percent addition of topsoil or compost can be a wise addition to the heavy soil backfill. The person handling the plant should not lift the plant by the top, which would break or loosen the ball. If the tree will not stand on its own or is loose in the ball, it should be staked. Staking reduces losses caused by wind, people, and other physical problems. If the tree is staked and mulched properly, the base of the tree will also be protected from mower damage. The twine or cord used in securing the ball must be completely loosened and cut away from the trunk. If not, the tree will be girdled and die. This problem is particularly evident when non-degradable twine is used. Any burlap containing the soil ball of the plant must be cut away and buried to prevent this material from acting as a wick that would pull water and moisture away from the soil and the plant. It is also recommended to cut and remove at least the upper third of the wire basket of the balled-and-burlapped tree. Methods of planting should follow the standards set by the American Association of Nurserymen in its manual, American Standards for Nursery Stock. Those standards also provide guidance for quality and size when purchasing plant material. All plants require maintenance in varying degrees. There are no plants entirely free of problems. Problems must be dealt with individually because there are thousands of cultivated plants, each with its own requirements. Maintenance common to plants includes watering, fertilization, chemical treatment for proliferation of pests and diseases, pruning, and eventual removal. Determining proper moisture levels for the numerous varieties of plants is difficult. Most plants should be thoroughly soaked and allowed to drain to the point of being dry before being watered again. Most plants will drown if overwatered, but drought conditions can also be damaging. Proper balance can only be reached by learning the peculiarities of individual plants. Many plants used in cultivated conditions require fertilization. Intensity of fertilization varies according to individual plant requirements. Turf grass plants that are irrigated on well-drained soils require fertilization several times each year, but a good shade tree in natural conditions may require no fertilization. Related to fertilization is the introduction of various trace elements lacking or trapped in the soil. This again relates to improper plant selection. For example, chlorosis (abnormally yellow color) in several varieties of trees is common and must be treated. Chlorosis may be the result of the tree not being able to get iron from the soil. Iron is either not present in the soil or not available to the plant because of some other soil condition. One of the most common causes is a combination of alkalinity and iron deficiency within the soil. The same plants located in the proper soil will not develop chlorosis. The various chemical treatment procedures that can be used in the maintenance of various plant materials are so numerous that only descriptions of common operations are presented. Most states require a chemical applicator's license or registration for at least one person responsible for chemical application. In addition to licensing, the requirement for developing and utilizing an integrated pest management (IPM) program is becoming more prevalent. A landscape IPM program is a multidimensional approach to pest management that evolved to address the ecological, social, and economic implications of overreliance on chemical pest control. The goal of IPM is to manage pests and their damage to tolerable levels. Typically, landscape IPM focuses on pest prevention and suppression rather than eradication. Current federal regulations require employers who transport, store, and apply hazardous chemicals to have a Hazard Communication Standard Program that obtains Material Safety Data Sheets (MSDS) from manufacturers for each hazardous chemical on hand. The MSDS must be made available to the employees, who must be trained on how to safely handle each hazardous chemical. For more information regarding the Hazard Communication Standard Program, contact your local or regional Occupational Safety and Health Administration Office. The insect or other organism must be identified before proper treatment can be selected. Identification includes timing, resistance, and life cycles. Pesticide application will become a subject of public concern if not properly monitored. Levels of toxicity are indicated by an LD(50) value. This is the amount of pesticide that is lethal to 50 percent of a test population in a single dose. It is registered in milligrams per kilogram of body weight and is shown as both dermal and oral indicators. This rating does not indicate hazard but rather the killing ability of a chemical. A chemical can be highly toxic but have little hazard potential because of the way it is used (or misused) and the way it is formulated. The lower the number, the higher the risk factor, because less volume of material is required to be lethal. LD(50) is not the only way of determining toxicity, but it is a good indicator. This describes the effects a selected chemical will have on various non-target plants. Incorrect selection and application methods will result in damage to other plants. An example is the injury to shrubs and trees when herbicides with mixtures of 2,4D are applied improperly to lawns for broadleaf weeds. Certain chemicals can be combined to resolve a combination of problems. There are many chemicals that should not be mixed or will not mix for many reasons. Awareness of chemical compatibility will avoid many problems. Other factors to consider when selecting a specific chemical are its effectiveness, residual behavior, method of application, and employees' capabilities to handle application problems. Shop rules for safety and procedural methods must be established. Reference publications are available that suggest methods of transportation and storage of chemicals, types of personal protective equipment and clothing, and the calibration of application equipment. Information is also available about other use factors of equipment, personal hygiene, and environmentally friendly methods of disposal. College and university agencies, such as agriculture schools and health services, state extension services, and manufacturers, are all sources of safety procedures. The problems inherent in exposure to agricultural chemicals, and the subsequent hazards of absorption into the body, cannot be overemphasized. Health testing procedures are available for use in protecting employees and, in turn, the institution. Chemical absorption can result in absenteeism and serious health problems. A good system of detection can benefit employees and possibly avoid future legal entanglements if hazards are discovered and treated properly. One of the most misunderstood maintenance procedures is pruning, which should not be confused with shearing. The quickest way to ruin plants and frustrate the original intent of a plant selection is to allow them to be sheared into round balls or flat-topped cones, unless a formal garden is intended. The use of the hedge clippers can injure plants and ruin the plants' intended purpose. Pruning should be done to remove dead or damaged branches, retain original plant shape, control the size of the plant, or renew the plant. Trained personnel should perform this function at specific times of the year as needed by the type of plant. On larger campuses, or where labor availability is a problem, pruning can be done almost anytime. If pruning is done at the wrong time of year, some sacrifices must be made, such as loss of flower or fruit the following season. Disease control is an important reason for pruning. Some infected plants or groups of plants can be spared the spread of disease if infected branches are removed and destroyed. In some cases, the pruning equipment must be sterilized after each cut to keep it from carrying the infection from plant to plant. Dipping tools in alcohol or spraying with a professional-strength aerosol disinfectant is effective. Additional pruning and training will be used for a host of other good reasons: to produce safe, structurally sound specimens; to create pleasing shapes that best display plants' ornamental qualities; to stimulate vigorous growth and encourage other desirable habits (e.g., dense, bushy growth in hedging plants); and to enhance flowering and fruiting. The maintenance problems associated with ivy-covered walls involve potential damage to masonry and wood moldings. The two most common ivy plants covering the walls of many buildings are the deciduous plant, Parthenocissus tricuspidata, commonly called Boston ivy, and the vine that does not lose its leaves, Hedera helix, commonly called English ivy. Each has its own advantages and disadvantages. Boston ivy grows rapidly, sometimes as much as 10 feet per year. Prior to losing its leaves each fall, like most deciduous plants, it displays fall colors of bright orange, red, and crimson. Boston ivy climbs readily on nearly any surface by using adhesive discs at the tips of its tendrils. These tendrils do not seek cracks or crevices but adhere to the surface. The vine should not be allowed to grow unrestrained behind and between moldings or joints, or on wood surfaces. English ivy, a dark green-leafed vine, is a much slower growing plant and, in some conditions, not nearly as hardy as Boston ivy. In certain locations, it will freeze back to the ground and must be removed. In the proper location, it is excellent as a ground or wall cover. Some smoother surfaces do not have enough texture to support English ivy. It climbs by means of aerial rootlets that cling to the substrate; these tendrils will seek cracks or crevices. In addition to the potential structural damage, English ivy will attract bees and other insects with its flowers produced from late summer until late autumn. These insects can be a bother to the human inhabitants of the buildings covered by this ivy. The fruit of this ivy ripens in late winter and is an important food source for many birds. In addition, birds, particularly pigeons, will nest in dense growths of this vine. Both vines provide shading of walls and insulation against bright sunshine. Ivy's value as insulation has not been determined but is significant. The added aesthetic value possibly outweighs the negative attitudes, costs to control growth, and potential structural damage. Interest in indoor plants has risen dramatically in recent years. Although the idea of growing plants inside is not new, it has never been so popular. Now tropical foliage plants in building interiors have become as necessary as they are fashionable. Plants not only beautify surroundings but also create an atmosphere of warmth and life. Most important, plants growing inside a building effectively remove harmful toxins from the air, they provide a naturally more comfortable environment that improves worker morale and efficiency, and studies indicate that they give people an increased sense of well-being. There are various architectural uses for plants, and architects and designers include interior foliage plants in their plans as a standard practice for several reasons. Plants can be used as a visual screen, they diffuse sound in open-plan space designs, they help soften hard lines or surfaces, and they add texture to nondescript areas. They give people directional clues and complement furnishings with color, texture, size, and shape. When plants are being chosen for interior landscaping or “plantscaping,” there are three primary considerations: location, type of plant, and size of plant. Location determines which types of plants can be used most satisfactorily and the size suitable for the particular surroundings. Because indoor conditions are usually not conducive to vigorous plant growth, plants that are already the desired size, or slightly smaller, should be chosen for installation. Indoor plants rarely outgrow their allotted space. Foliaged plants most often found in campus buildings are placed in public areas such as entrances, hallways, lobbies, and lounges. Light intensity and duration are crucial to plant health. Therefore, it is important to place plants near a good light source. The brighter the light provided, the shorter the period of illumination required. Most plants require 8 to 14 hours of artificial light a day, if that light is between 200 and 500 foot-candles (a foot-candle is one lumen of light projected on 1 square foot of area). Sunlight is the most desirable kind of light but may be unavailable. If artificial light is the sole source, fluorescent is better than incandescent. Fluorescent light produces darker green foliage and more compact growth. Plants grown in incandescent light have a tendency to become weak and spindly. Insufficient light results in loss of lower leaves, weak stems, pale coloring, and the potential death of the plant. Foliaged plants require moderation in both temperature and humidity. Generally, what is comfortable for people is appropriate for plants. The specific temperature range in which most plants thrive is 55ºF to 80ºF. Avoid placing plants near drafty doors or windows because these areas may be significantly cooler than the rest of the area. If the heating, ventilation, and air-conditioning system removes too much humidity from the air, install a humidifier. Insufficient humidity creates symptoms similar to those of underwatering. Leaf tips turn brown, margins yellow, and growth is stunted. Too much humidity over a long period makes plants susceptible to bacterial and fungal invasions. How well a plant grows is determined by the controlled environments of building interiors. Light, temperature, ventilation, humidity, soil moisture, and nutrients are interrelated and affect the appearance, strength, and health of plant material. Consistently adequate soil moisture is a critically important requirement for healthy plants. Plants grown in artificial light require substantially less fertilization than do those grown in natural light. The less light received, the slower the growth rate and therefore, the less need for nutrients. A balanced fertilizer containing nitrogen, phosphorus, and potassium should be used. Pest infestations are common among plants growing indoors and may need to be professionally eradicated. Personnel applying restricted-use insecticides are required by state law to be certified. Foliage must be cleaned regularly to keep plants healthy and attractive. A heavy coat of dust clogs the stomata, the cell openings that allow for the exchange of gases and the release of moisture. Most plants can be sprayed with a mixture of one tablespoon of liquid dish soap with one gallon of water to help keep them clean, shiny, and healthy. Pruning can be performed to encourage new growth, enhance plant shape, remove undesired branching, or remove dead or diseased material. Many grounds maintenance departments maintain staff specializing in plantscaping; however, due to the continual need to replace declining plants and the facilities and costs involved in doing this in-house, this work is generally contracted out. Hiring a plantscaping company is an excellent alternative, given the number of companies specializing in this work. These firms are experienced at maintaining as well as selecting and installing interior foliage. They can provide the skills needed to lengthen a plant's life indoors and thus reduce replacement costs. In addition to maintaining existing plants, many of these companies offer purchase-only, purchase/maintenance, and lease/maintenance contracts. With increasing environmental regulations aimed at reducing the use of landfills, composting operations are becoming more common on college and university campuses. Wet garbage, yard waste, and other humus material on campus can be composted. Although a composting facility will require grounds space, special equipment, and staffing, it will prove useful in reducing the solid-waste stream. The composted material can be used in amending soils, as top dressing, and to reduce water consumption. In addition, wood from forestry operations can be chipped and used as mulch, saving significant material costs. Maintenance of paved surfaces, storm drainage systems, campus furniture, fountains, signage, fences, retaining walls, and other external campus improvements is often an important element of the grounds maintenance function. Each of these areas requires special skills and knowledge for effective care and maintenance. Paved surfaces can range from loose gravel to hand-laid tile or exposed aggregate surfaces. Each material requires its own maintenance methods, but there are some common practices for all. Before any material is selected, consideration should be given to its intended use, type of traffic, cost of installation, cost of maintenance, life expectancy, aesthetic conditions, material availability, and weather and seasonal factors. In regions subject to ice and snow, consideration should be given to the suitability and durability of pavements that will be subject to mechanical snow removal or the use of chemicals for ice control. The most common problem of paved surfaces is the lack of drainage. This problem often occurs in climates that expose surfaces to continued freeze-thaw cycles. Common to all pavement types is the need for a proper base. A soft subbase, caused by wet, poorly drained conditions, results in pavement movement, "pumping," and other problems. Good drainage is essential to effective pavement maintenance. Concrete pavements are widely used and can provide a durable, easily maintained surface. However, a number of problems can result from poor quality in the mixing or placement of concrete. Improper proportioning of materials in the mix, or too much or too little water, can result in a poor-quality or low-strength material. Overworking of surfaces, retempering, or excessive water can produce surfaces that will crack or spall. Good storm drainage is essential to a well-functioning campus environment. Undersized lines are a frequent cause of storm drainage failure. Ensuring an ample margin of excess capacity is the best policy when designing drainage systems, because future growth is likely to add hard-surfaced areas that increase runoff. Adequate manholes are important for cleaning operations. Cleaning of storm sewer inlets should be scheduled as part of the preventive maintenance program to ensure consistent flow capability. Cross-connections into sanitary sewers should be sought out and corrected as a matter of resource conservation and current code compliance. A variety of exterior campus furniture is needed for a well-ordered and functional campus environment. Furniture can include benches, light standards, refuse receptacles, planters, newspaper distribution boxes, signage kiosks, and fixed or moveable athletic equipment. Design standards and color choices should be established as part of a comprehensive landscape plan for the campus to ensure that exterior furniture is in harmony with the architectural character and general design of the facilities. Site furniture is subject to all the effects of weather, so a regular program for cleaning, repainting, refurbishment, and replacement is important to include in any work plan. Outdoor art and displays represent a peculiar challenge. Special maintenance, such as regular sealing and cleaning of sensitive and unusual materials, is often required. Some art is actually part of the landscape (see Figure 3) and may require specialized equipment. At the point of installation of such art, a maintenance plan for these items should be developed in conjunction with the artist and the administration. Fountains and other water attractions are appealing and can add much to the quality of landscaped areas. However, they can represent a significant investment and can be difficult and costly to maintain. In addition to grounds maintenance staff, maintenance can require the participation of mechanical and electrical shops for care of pumps, nozzles, lighting, and other mechanical features. Regular water treatment is necessary in warm climates or during the summer to control algae growth, and occasional emptying is required for cleaning and the removal of foreign objects. Regular refurbishment and resealing of fountains and other water features will also be necessary. A proliferation of nonstandard signage and exterior graphics can be the single most significant item creating visual clutter on a campus. Careful planning and coordinated and compatible design and lettering are essential to a successful signage and exterior graphics program. Strong institutional guidelines and standards should govern all types of signage, visual graphics, posters, traffic control signage, and informational and directional signage. These standards should specifically establish responsibility for management and enforcement of the program. Posters should be limited to strategically placed bulletin boards and kiosks on campus, and these should be regularly cleaned and policed to remove old, outdated material. Building identification and directional information signage should follow set standards using appropriate and consistent colors, locations, sign sizes and shapes, and lettering styles. A consistent, uniform exterior signage program can play an important role in creating visual continuity and a distinctive institutional image throughout a campus. In many areas, graffiti on building surfaces, signage, or other exterior surfaces can present a major maintenance problem. Institutions faced with this problem have learned that allowing it to accumulate only encourages more, while prompt and complete removal soon discourages it. A number of effective cleaning materials are now available to seal surfaces, or to remove all types of paint and other marking materials. Similarly, improperly placed or unauthorized posters or other signage should be promptly removed to discourage their proliferation. Fences are often required to direct traffic and restrict use to designated programs and to secure areas. In some cases fences can be replaced by plants and pavements can be redesigned to provide proper traffic flow. Extensive use of fencing should be avoided. Too much fencing can obstruct views or diminish the aesthetic continuity of space. Fencing materials should be pleasing and unobtrusive but still do their intended job. Darker colors help fencing recede visually. Fencing that is compatible with site furniture and existing architecture could represent the character of the surrounding area. Temporary fencing should be avoided. Concerted effort with student organizations to encourage people to refrain from cutting corners or creating paths in turf areas and shrubs can reduce the need for obtrusive temporary fencing. The removal of snow and ice during the winter months can represent one of the toughest problems for grounds maintenance crews at institutions in northern climates. Litigation resulting from slips and falls have only put additional pressure on this difficult assignment. Snow and ice removal that is not well handled can have serious public relations consequences for the facilities organization. A successful effort that serves the institution well will be based upon clearly established and recognized priorities and carefully developed planning and procedures. Although every person on campus would like a high priority for his or her department, parking space, or building, snow and ice removal can be successfully accomplished only by following clearly established priorities that meet recognized needs. At institutions with medical centers that provide 24-hour emergency care, access to this service from major arterial roads and sidewalks is critical. Student health centers that provide similar emergency care would also have a high priority. Second priority is usually assigned to power plant service areas, residence halls, and food services areas. Then the remaining main roads and walks serving classrooms and research buildings are cleared of snow. Handicap ramps and curb cuts, a high priority for mobility of a limited number of people, are of no value until the surrounding streets and walks are in passable condition. Therefore, ramps and curb cuts should have the same priority as adjacent surfaces. Widespread publication of the basic priorities and principles of the snow and ice removal plan can help to forestall much of the criticism and controversy that usually come with a major snow removal effort. A workable system of mobilization is of prime importance. The responsibility for initial notification rests with a department and specific individuals who are on campus during nonworking hours. If snow or ice conditions occur during working hours, the removal process can begin as needed. In the evenings, on weekends, and during nonbusiness hours, the responsibility for callback must be clearly established. The job is often assigned to campus police, as they are on duty 24 hours a day, every day. The decision to call out employees or contractors is difficult and must be based on experience as well as other readily available information. National and local weather forecast information and contacts with local agencies are important. Managers should consider communicating with the institution's top administrators if conditions warrant restricted movement or school closing. A good rule is always to err on the side of calling people back sooner or calling back more staff than prove necessary. Once a major storm has gotten the upper hand, it can be almost impossible to recover. Personnel to form crews for snow emergencies can come from several sources, and duties should be assigned to relate as closely as possible to normal assignments. Custodial employees can remove snow and ice from entrances, steps, and landings. Grounds maintenance employees, usually experienced with heavier equipment, should be responsible for snow removal from sidewalks and curb cuts. Street and parking lot snow removal may be assigned to grounds maintenance crews or to a campus service group that operates heavier equipment and trucks. Equipment maintenance personnel should be on duty to repair breakdowns and install plows. Some institutions supplement their regular maintenance crews with part-time student workers during periods of heavy snowfall, and many institutions have standing contracts to use contractors and their equipment for snow removal. A strong agreement on participation in emergency call-out procedures should be made with employees and their labor organizations. Some employees may delay their response to emergency calls or not respond at all. The established policy should include method of contact, response time expected, payment for overtime or compensatory time granted, and job responsibilities. In the case of an emergency condition that could last for many hours or days, it is important to phase the working hours of available labor. Repetitive shifts in cold weather should last a maximum of about 12 hours. Beyond this, efficiency and safety capabilities decrease rapidly. Just before the first snow or ice conditions are expected, hold a brief meeting of all employees and contractors to explain or review the mission and expectations of the operation and delineate responsibilities of the various crews. It is helpful to ask various agencies on campus to send representatives. Interested agencies include security, traffic, custodial, and general administration; in addition, someone should represent accessibility issues. Problem areas can be discussed and special requests or expectations presented. Instruction and training in the use of equipment and distribution of salt is invaluable. Damage to the campus can be extreme if care is not taken. Plow damage becomes quite obvious as winter snows melt and grass does not grow. Attention to details can make snow removal a success. Placing stakes at walk intersections to guide operators when the area is entirely covered, or providing coffee and hot chocolate for employees during long hours of overtime, improves the operations efforts. Equipment funding, staffing, policy, procedure, local snowfall, and the physical characteristics of the snow removal areas all directly influence the types of snow control equipment best suited for each campus setting. It is important that all of these factors be considered when evaluating equipment, as many varieties of equipment and materials are manufactured to clear, remove, and melt snow and ice. Once policies, procedures, and staffing patterns are established, other factors can be considered, such as the physical characteristics of the snow removal areas. Characteristics such as street, sidewalk, and parking lot sizes; vehicle weight restrictions; snow emergency zones; street and sidewalk bollards; and bridges are all factors that need to be considered when purchasing or evaluating equipment. Because funding for equipment is generally limited, it is important to select equipment that will be cost-effective. For instance, will tractors, commercial lawn mowers, and dump trucks be equipped for snow and ice control? Utilizing a piece of equipment that might otherwise sit idle in storage will greatly increase the equipment's return on investment. Will the equipment handle the workload during severe weather conditions? Consideration may be given to contracts with state, county, or local public works to share equipment and routes. These questions must be asked, in addition to studying manufacturers' recommendations, observing equipment demonstrations, and visiting nearby institutions to observe other snow control programs. Once a program is established, fine-tuning begins through a trial-and-error process. What works in one area may not work in another. As the snow control program is carried out, meetings should be held to discuss and review its effectiveness. The supervisor should implement worthy suggestions from the staff and keep track of which techniques work well. Be prepared. Organize the snow control program several months in advance. Ensure that supplies are ordered in a timely fashion. Have vehicle maintenance employees winterize equipment to be pulled from storage, and equip the tractor mowers and dump trucks with plows, tire chains, and salt spreaders. Order snow-melting compounds suitable for the local winter conditions, and have them ready in their storage areas. The Snow Fighter's Handbook, available from the Salt Institute, contains information pertaining to all phases of snow control. The American Public Works Association schedules an annual snow conference that can be a valuable training resource. To remain effective, a snow and ice removal plan should be reviewed and updated each fall, well in advance of winter weather, and the updated plan should form the basis for training all essential snow and ice control personnel. As budgets allow, every effort should be made to minimize the use of sand and salt without compromising safety. Anti-icing is the practice of applying liquid brine to the paved surface which allows for easier and more thorough mechanical removal. Rotary brooms are an excellent tool for removing snow and should be incorporated in a snow removal plan. Focusing on mechanical removal will result in less salt use, reducing the negative environmental impact.